Engineering they are eligible to apply for this DRDO Senior Technical Assistant STA Recruitment 2018. 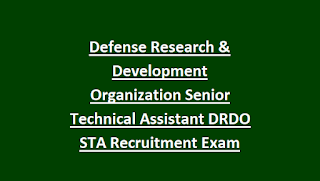 There is 494 Senior Technical Assistant STA B jobs in this DRDO Recruitment 2018. Candidates selection is based on Preliminary Exam Tier 1 and Mains Exam Tier 2. Exam Pattern and Syllabus for DRDO STA B jobs Tier 1 and Tier 2 is updated below. Online applications for this DRDO CEPTAM STA Recruitment will be accepted from 04-08-2018 to 29-08-2018. DRDO Senior Technical Assistant Admit card released date, Tier 1 exam date, exam syllabus and other information about this DRDO STA Recruitment 2018 is given below. 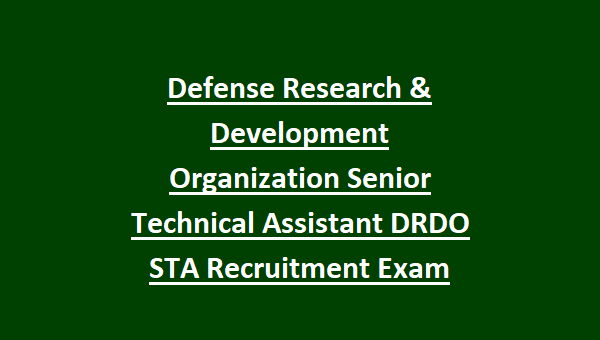 There are total 494 Senior Technical Assistant STA vacancies in this DRDO Recruitment Exam 2018. Candidates who qualified B.Sc Agriculture/Botany/Computer Science/Electronics/ Geology/ Library Science/ Mathematics/ Photography/ Physics/ Zoology Degree of Polytechnic Diploma of 3 years they are eligible to apply for this DRDO STA recruitment 2018. Age limits are 18-28 years for this DRDO STA Recruitment. Candidates selection for STA Posts is on basis of Tier 1 Prelims Exam, Tier 2 Mains Examination and interview for this DRDO Recruitment. DRDO STA Exam will be conducted in two stages. Tier 1 Prelims Exam is objective type only. Candidates who cleared the Tier 1 exam they are only eligible for Tier 2 exam. Tier 2 exam syllabus will be based on respective subject which you applied at the time of online application form. Online applications only accepted for this DRDO STA B posts from 04-08-2018 to 29-08-2018. Official website to submission of application form online is www.drdo.gov.in. Exam Syllabus is degree or diploma level subjects. Admit card date, exam dates will be updated in this website only. Admit card for DRDO STA Tier 1 Exam will be available 10 days before the exam date. 1. Can B.Tech candidates are eligible apply online for this DRDO STA B Jobs? A. No, B.Tech or M.Sc or PhD candidates are not eligible to apply. 2. 10+2 candidates are eligible to apply or not? A. No, only B.Sc Degree or Polytechnic Diploma competed candidates are eligible to apply online. 3. Written Exam will be conducted in Hindi or not? A. Probably Tier 1 Exam will be in Hindi and English but Tier 2 exam will be in English. 4. How much salary will get per month for this STA Post of DRDO? A. Approximately Rs.50000/- will received per month.